I've been busy drying lavender and takings cuttings to increase my stock this last week or so. I've put up some tutorials for you with step by step photos and tips. 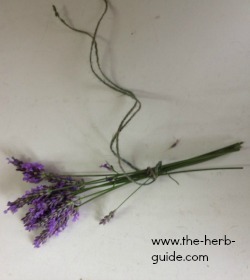 It's really easy and buying dried lavender to perfume your drawers and cupboards through the year is quite expensive - so easy to do it yourself - you might even make a few sachets or bunches to give away as gifts. I've had emails about growing lavender and I've done a 2 part tutorial on how to grow lavender from cuttings. The links are below and I hope you find them useful - if you have any questions or comments, then please email me or leave feedback via the Facebook commenting box at the bottom. So that's it for now - short and sweet like I said. If you have any suggestions for tutorials that you would like me to write, then please get in touch - at the moment, my plan is to do garlic butter (plus info for other herb butters) and garlic bread. By the way - I have uploaded my 50 Fish and Seafood Soup Recipes eBook as a 5 part eCourse - please visit here to get your copy. 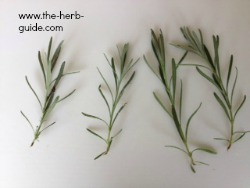 Recent new and updated pages can all be found on the Herb Guide Blog. I have written an eCourse 8 Essential Culinary Herbs which I am giving away to people who subscribe to my newsletter. If you have not yet downloaded this, then please go to this invitation page and complete the form to get your copy delivered to your inbox. If you have any questions or comments, then please go here. That page is for public comsumption - if you want a private email, then use the contact page on the navbar.